The Queen of Sheba visits Solomon, having heard of his wisdom and wealth, to see for herself. She arrives in Jerusalem with camels, spices, gold, and precious stones. He answered all of her questions. 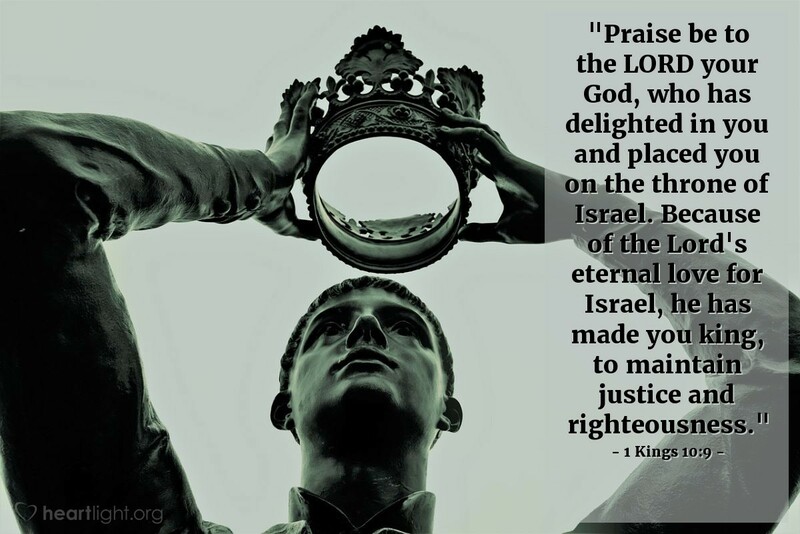 She praised him for his wisdom and praised God who put him on Israel’s throne to maintain justice and righteousness. She gave him gold, spices, and precious stones. Solomon gave her gifts in return. 9) The Queen of Sheba had heard about Solomon’s fame and about his relationship with God, so she came to test him with hard questions. She was impressed by his answers to all her questions, his wisdom, his palace and food, his officials, his servants and cupbearers, and the burnt offerings he made to God. 10) She concluded that his men and officials must be happy. She concluded that God delights in Solomon and has placed Solomon on Israel’s throne because He loves Israel and wants to see justice and righteousness amidst His people. 11) Part personal Question. My answer: Solomon and Jesus are both wise. Both were kings. Solomon died. Christ died, but rose again. Both were promised to reign forever. Only Jesus fulfilled that promise. Both do things for their people. Solomon is influenced by sin, so he eventually falls away from God; whereas, Jesus never does. Both face temptation. Solomon gives in; Jesus does not. I am not wondering if Jesus is all that he claims to be. I don’t have any hard questions for Jesus. Life is how it is because we are sinners. I wonder about things, but who doesn’t? I don’t question Jesus, however. I find this story fascinating. It is a lost tradition these days to visit people of renown, seek their wisdom, and exchange gifts. In ancient times, this happened all the time between rulers. Our leaders do this somewhat today, but it seems it’s not as meaningful. I like how because of Solomon’s example of following God, the Queen came. We can do the same thing. Lead a Godly life, and others will follow our lead. Sheba (also known as Sabea) was where modern-day Yemen is today (Southern Arabia). 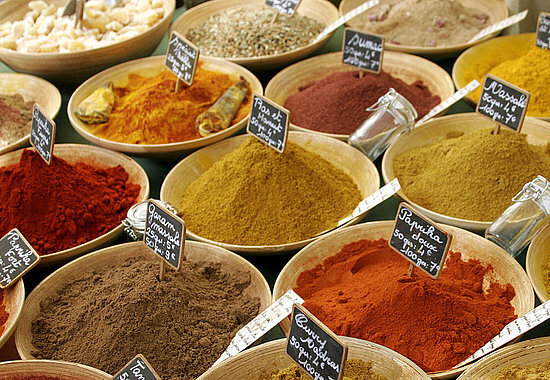 We know from geography this was a wealthy kingdom with much gold, spices, and precious woods. History also tells us that they were known to have queens as well as kings. This was a long trip – up to about 1,500 miles (2,400 kilometers). She probably came as part of a trade delegation (1 Kings 10:2-5), but there is no doubt that she was highly motivated to see Solomon and his kingdom. She came to Solomon and Israel at their material zenith. The great prosperity, splendor, and wisdom of Solomon’s kingdom were internationally famous. This queen traveled in the manner of queens, with a large royal procession, heavily laden with gifts and goods for trade. This Queen was obviously familiar with the world of royal splendor and luxury. Yet she was completely overwhelmed by the wisdom of Solomon and the glory of his kingdom. This is what God wanted to do for Israel under the promises of the Old Covenant. God promised Israel that if they obeyed under the Old Covenant, He would bless them so tremendously that the world would notice and give glory to the Lord God of Israel. God wanted to reach the nations through an obedient and blessed Israel. If Israel did not obey, then God would speak to the nations through a thoroughly disciplined Israel. 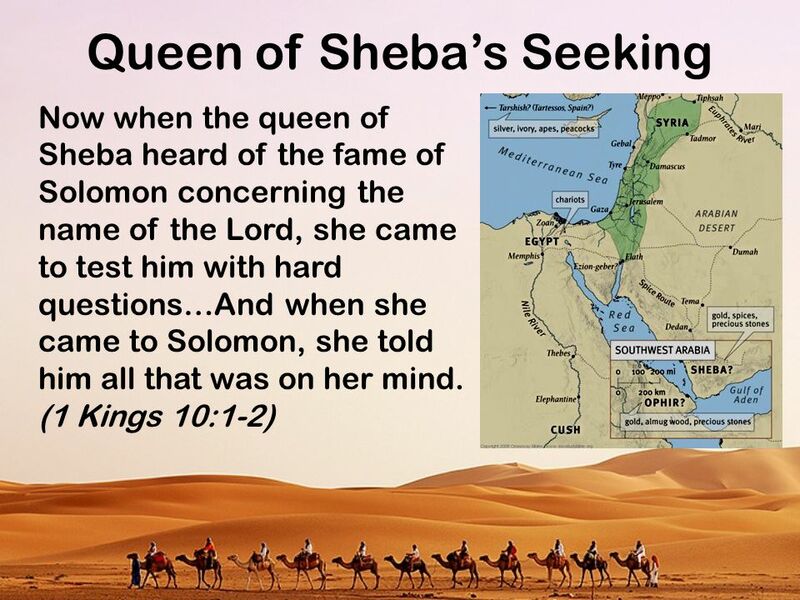 The Queen of Sheba is an example of a seeker. Solomon impressed her with his wealth, his splendor, and personally. But she returned home without an evident expression of faith in the God of Israel. This shows that impressing seekers with facilities, programs, organization and professionalism isn’t enough. The Queen of Sheba came from a great distance. The Queen of Sheba came with gifts. The Queen of Sheba came to question and to learn. The Queen of Sheba came and saw the riches of the king. The Queen of Sheba came for an extended period. The Queen of Sheba came with an open heart and telling all that was on her heart. Jesus used the Queen of Sheba as an example of a seeker: The queen of the South will rise up in the judgment with this generation and condemn it, for she came from the ends of the earth to hear the wisdom of Solomon; and indeed a greater than Solomon is here (Matthew 12:42). If the Queen of Sheba sought Solomon and the splendor of his kingdom so diligently, how much more should people today seek Jesus and the glory of His Kingdom. The Queen of Sheba will certainly also rise up in judgment against this generation. Solomon was not necessarily the most logical successor of his father David. There were several sons of David born before Solomon. He was indeed the Lord’s choice to lead His people. Summary of passage: Paul tells the Romans he plans to visit them on his way to Spain. However, now he’s headed to Jerusalem to deliver funds he has raised from Macedonia and Achaia. The Gentiles owe the Jews for sharing in the spiritual blessings. After this trip, he is headed to them. 10) He longed to visit the Roman church but he needed first to go to Jerusalem to deliver funds he has raised from his travels to Macedonia and Achaia. 11) Duties come first. Paul wants to go to Rome but first has to deliver the funds he has raised. Priorities are important. 12) Part personal Question. My answer: Macedonia and Achaia 1) were pleased to donate 2) had a duty to donate to the Jews since they now share in the spiritual blessing. Giving is a blessing and should be grateful to do so and we should give to those who have helped us along the way. Conclusions: Put God’s will for your life first. You will be blessed for doing so. God’s will leads to unexpected plans for your life! End Notes: Paul wrote Romans while traveling to raise funds for famine relief. In another letter (2 Corinthians 8) he gives more details on this mercy mission on behalf of the Jews in Jerusalem. Paul’s actions set an example of unity for a church composed of both Jews and Gentiles–unity sorely needed by groups wracked by the divisions described in Chapter 14. Paul’s pioneer work came first. Paul probably wanted Rome to be his base of operations for the western part of the empire, even as Antioch was his base for the eastern part. Paul had these plans; yet things did not work out according to his plans. He did go to Rome, yet not as a missionary on his way to Spain. He went to Rome as a prisoner awaiting trial before Caesar, where he would preach the gospel on a different kind of frontier. God had other plans for Paul, which led to unexpected opportunities. As a prisoner, Paul was able to preach to the Roman emperor! After his release from the Roman imprisonment at the end of the Book of Acts, Paul did in fact make it to Spain and preached the gospel there. Paul thought he would stop in Corinth on his way to Jerusalem to deliver a collection from Christians in Macedonia and Achaia (Acts 20:1-3). Paul sets the example: We should help those who have helped us. The Gentile Christians of the broader Roman empire had received so much spiritually from the community of Jewish Christians in Jerusalem, it was only right that they help the Jerusalem Christians in their need. Paul wanted to present this gift personally to convey the lvoe and concern of the Gentile churches for their Jewish brothers and sisters in Christ. Summary of passage: Jesus appeared to the disciples as they huddled together, afraid of the Jewish authorities. He showed them his hands and thighs and the disciples were overjoyed at seeing Jesus. Jesus gave them the Holy Spirit and commissioned them to the world. 9a) He personally appears to them. He gifts them with the Holy Spirit to guide them in his ways. He shows them his wounds. He blesses them with peace. b) Personal Question. My answer: Above all, by choosing me to be a believer. By giving me a purpose for my life and a means to achieve it through Him. 10) He appears to Mary who clings to him physically. He appears to the disciples and shows them his wounds physically. Luke tells us he ate food with his disciples. He appeared to the disciples and others over a period of 40 days and spoke of God’s kingdom. He appeared to more than 500 of his brothers at the same time. He appeared to James. He appeared to Paul on the road to Damascus. Jesus must rise again to conquer death so we can live forever with the Father. It proves the Gnostics of the time wrong that he only died a spiritual death. 11) Privilege: They are the chosen ones to spread the Good News. Authority: Jesus personally commissioned them. Power to accomplish the commission: Jesus gave them the Holy Spirit to aid in their mission and peace as well. Message: If you forgive others, they are forgiven as Jesus has forgiven them of their sins. If you don’t forgive them, they aren’t. Conclusions: Not a big fan of these questions. Repetitive. Jesus prayed for them to stay together and they did (John 15:17)–all except Thomas, who we don’t know why he wasn’t there. Jesus visits small groups of people (one exception in 1 Corinthians 15:6) in remote areas or closeted indoors. By the garden tomb, in a locked room, on the road toe Emmaus, beside the Sea of Galilee, atop Mount Olives–such private encounters bolster the faith of people who already believed in Jesus. Fun Fact: As far as we know, not a single unbeliever sees Jesus after his death. What would have happened if Jesus made a public spectacle and appeared before Pilate? Would it have bolstered faith? Jesus tells us no. “If they do not listen to Moses and the Prophets, they will not be convinced even is someone rises from the dead” (Luke 16:31). Jesus appeared amongst them despite the locked doors. Jesus did not rebuke his disciples for abandoning him at the cross. Instead, he told them “peace” or all is well. Jesus revealed himself and invited all present to touch him to prove he’s real (Luke 24:39-40). Jesus came for us. He was also calming the disciples at his sudden appearance. Jesus commissions them to do his work on earth such as he prayed in John 17:18. Luke tells us there are others there besides the disciples. Jesus sends them as well! We are sent in the same way–for Jesus! Jesus gives the disciples the Holy Spirit as their guide, John purposefully connecting this with Genesis, saying Jesus breathed on them. Cool! I want Jesus to breathe on me! This is re-creation or born again. This is Jesus’ spirit as well. This also creates the duty of the church to forgive and warn of the consequences of unforgiveness. We are the messengers, announcing forgiveness according to God’s word. In essence, if you repent of your sins and believe in Jesus as our Lord and Savior, you will receive God’s forgiveness. Summary of passage: Peter says Jesus is the living stone who was rejected by men and chosen by God and precious to him and so are we (Christians) living stones being built into spiritual houses and holy priesthoods. The stone (Jesus) is precious to believers as our cornerstone but unbelievers reject the stone and is now the capstone and a stone that causes those who disobey the message to stumble. We are a chosen people, royal priesthood, holy nation, belonging to God, and called into the light from the dark. We are God’s people out of His mercy and aliens and strangers in this world. Abstain from sinful desires and live such good lives that the pagans will glorify God. 9) living, chosen, precious, cornerstone, capstone. Living is eternal life, not death. Chosen is preordained, not a randomness; planned out. Precious is highly valued and esteemed; of high price and cherished. Corner and cap are the descriptive terms attached to stone, which mean they are the key part. The cornerstone forms the base of the corner of the building and the rest of the blocks depend on it in order to stand. The capstone is a stone affixed on top of a building to cap it off; the final touches, achievement, stroke or culmination of the building. So here Jesus is both the foundation on which the building stands and its crowning achievement at the top. I don’t like the use of the word rightly here. It implies there is a wrong way to respond, which if your heart is sincere, there isn’t. 10) Christ causes men to stumble because they disobey the message. It’s why we all stumble: we turn our backs on Jesus, God, and His word and follow our will instead of His will. Everyone trips up and falls but it’s whether we have Christ or not that determines if we are able to get back up and back on the right path–His path. Or if we will keep stumbling our entire lives. 11) Chosen people, royal priesthood, a holy nation, belonging to God, called into his light, people of God, received mercy. They are all important but I like holy nation because being holy allows me to be with God, righteously. 12a) If you are walking in Christ’s footsteps, you are living every day as an alien and stranger in this world for our home is in heaven, not on earth (see discussion HERE). We are God’s chosen people, separate from unbelievers, set aside for eternity. The Holy Spirit lives within us; therefore, we are different and our lives should reflect that. We live according to God, not others. Thus, we should live in every way as an alien and a stranger. b) My missionary friend who truly walks with God every day. She shines with God and inspires me to do the same. Conclusions: This lesson was only blase for me. We just got done studying this in my other bible study and I see nothing new here. It’s repetitive, which I know the Bible does a lot of so we mere humans get it, so it’s important. But could be my mood today. I guess I was hoping for more swords and shields rather than building analogies (I’m more of an action person rather than one who has the patience to design intricate buildings). Summary of passages: Isaiah 63:1-14: Isaiah poses the question, “Who is coming from Edom, robed in splendor, garments stained crimson?” Jesus says, “It is I…mighty to save.” Isaiah asks, “Why are your garments red?” Jesus says because He has trodden the nations alone in His anger so their blood spattered His garments. The day of vengeance was in my heart and the year of my redemption has come. No one was there to help so my own arm and wrath brought salvation and sustained me. I trampled the nations in my anger and poured their blood on the ground. Isaiah now tells of the Lord’s kindnesses and the deeds for which He is to be praised: He became their Savior, in all their distress He too is distressed, His love, and His mercy. Remember the days of Moses where the Lord set His Holy Spirit among them, divided the waters, and were given rest by the Spirit of the Lord. Revelation 19:11-16: Heaven opened up and a white horse and rider whose name was Faithful and True stood before me. He judges and makes war with justice. On his head are many crowns. His name no one knows but He himself. His robe is dipped in blood and is name is the Word of God. He had armies of heaven with Him. He will strike down the nations. He treads a winepress of the fury of the wrath of the God Almighty. His name is written on his robe: King of Kings and Lord of Lords. 9a) In Isaiah, Jesus is the only one who is mighty to save. Isaiah says His garments are red and in Revelations we learn He is dressed in a robe dipped in blood and his name is the Word of God (Jesus). In Revelation He is wearing crowns. In Isaiah the day of vengeance is in His heart which must be Jesus since only Jesus judges and He will usher in the day of vengeance (see John 5:22). b) He has defeated His enemies, ushering in the day of vengeance and the year of His redemption. In essence, Jesus has destroyed the bad guys and saved the good guys. This was accomplished through His own arm and powered by His wrath. He made them drunk and poured their blood on the ground. Yet, God does get angry when His word and laws are broken (such as in idol worship, etc). Half of the study of Isaiah was about God’s wrath and anger at His people’s constant disregard for Him and His word. This is similar to man’s anger. We get mad when things don’t go our way, when our children disobey, when bad things happen to us, or even as minute as someone cutting us off in traffic. 10a) To remember God’s character: His compassion, kindnesses, blessings, good deeds, love, mercy, and that when His people were distressed so was God so He sent the angel of His presence (Jesus) to save them. Recall the days of old, the days of Moses when God rescued His people from Egypt and how God sent His Holy Spirit to guide them and dwell among them. Remember how God divided the waters and how they were given rest by the Spirit of the Lord. b) Personal Question. My answer: Because it’s easy for me to forget. Earthly endeavors and the Devil constantly distract and pull us away from God so to survive in this world I have to keep His love and faithfulness in the forefront of my mind. c) Personal Question. My answer: My husband’s job has flourished finally after 2 lay-offs and many moves. My faith in God has grown and my writing and this blog is a complete blessing. The importance His word has become in my daily life. Conclusions: I definitely don’t want to be the bad guys here. The picture painted is horrific and gruesome. BSF needed to give us a lot more space today. This passage is packed and I couldn’t get all of my observations written down. Good thing I can tell you all here in as many words as I want! I loved question 9c. It got me thinking about how I personally react when I get angry. It is a reaction usually and not an action like God does. Man snaps. God never does. I’ve been in situations where I have completely flipped out over something that later seemed absolutely silly. But my emotions and my anger took hold and I reacted with little control or thought over my actions. Great reminder of how I’m still trying to be more like Jesus.